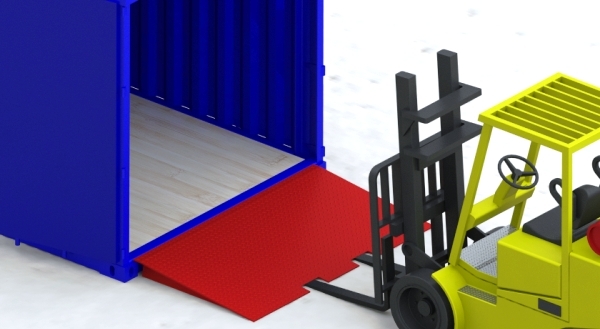 Further to our range of yard ramps, we also offer a range of ramps to enable access into shipping containers at ground level. Standard units are 6,000Kg or 10,000Kg capacity to suit your requirements, though others are available on special request. Ramp only – This is a one piece design, moved from the front by FLT. Provides a constant incline up to the container floor. Ramp and platform – a one piece design, moved from the side by FLT. Provides a level working platform (typically 2m in length) to allow horizontal access and thus prevent tightly packed goods from impacting the top of the container. Movement by fork truck pockets allows movement by one operative only. 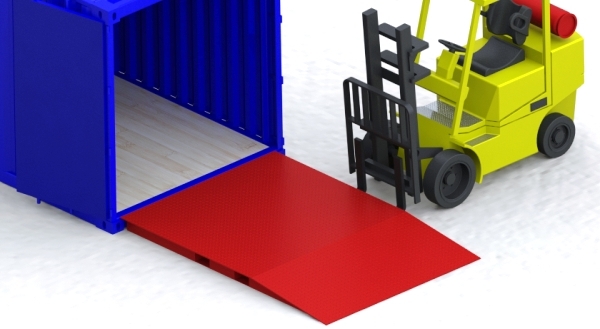 These ramps are designed to be used with most standard shipping containers with ~150mm floor height. Contact us for further advice if you are using temperature controlled containers, or similar, with raised or set-back floor levels.